Pictures are worth a thousand words, especially when you look at this cute diaper cake and how it is used in the table setting for this adorable baby shower! The diaper cake itself is darling, complete with a cabbage patch doll and butterflies. The table setting is equally as pretty, with cupcakes, a copy of the invitation and a framed picture of the ultrasound. This wonderful submission is from another amazing reader of this website. It is so delightful to see how everyone comes here for ideas and then makes their own amazing diaper cake design. What a Cute Diaper Cake! Thanks for sharing! Would you like to share your diaper cake ideas, pictures and/or instructions? Submit them here! I did a butterfly themed diaper cake. I used about 56-60 diapers size 1 or 2 and I used the pampers. I did three tiers. I used bottles in the middle as the base, 2 8 oz bottles & then filled them with candies. You can use any candies you like. I used lifesavers mints because they don't melt. I didn't use a bottom base for the cake because I displayed it on a cake stand at the shower on the table with the cupcakes. I bought a bag of different size rubberbands at the dollar store & also got the ribbon I used to decorate with at the dollar store. I got the butterfly clips at Michaels Craft store. The bottom tier of the cake had 3 rings around the bottle, the middle tier had 2 & the top was just 1 ring. I got the Cabbage Patch Kid doll at Walmart & it was a mini one. It was called a fairy or something I don't really remember, but it had the butterfly wings so I thought it was perfect & stuck it between the top tier so it popped out to look like a cake topper. 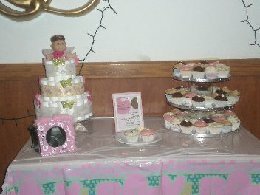 I displayed it on the table with the cupcakes like I said & also put her invitation in a frame on the same table & also a frame that my mom bought that said The Princess's room or something & we put the sonogram pic inside & put that on the table too. It looked really nice. I found the cutest invites on a website called littlepinkchic.com & they also make matching address labels & thank you cards so I ordered those for my sister & had them do the address labels with her name & address on them so when she sent out the thank you's they matched. The site has a great selection & pretty reasonable prices. For games I bought pretty computer paper at the dollar store & printed games I found online from my computer. We played the baby gift bingo, the dirty diaper game ( you melt 2-3 different mini chocolate bars in a diaper & pass it around. Everyone has to guess what candy it is & then whoever does wins a prize) & then we also played "How well do you know the mommy to be" (it's as many questions as you want, but I did 10 about the mommy to be). I ordered personalized pencils that had toppers on them of pacifiers & personalized hershey kissed from oriental trading. The favors were shower gels from Avon in different scents & I wrapped them in clear bags, put the easter grass in the bags & tied them with ribbon & labels that matched her invites. That website for the invites also makes matching favor tags. Such a Cute Diaper Cake! Thanks for sharing it with us!! 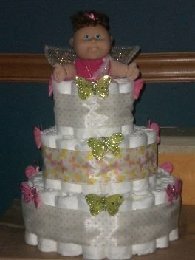 Wanting to make your own diaper cake, but it sounds too hard? Follow these detailed diaper cake instructions that make it easy!